Root canals are sometimes necessary to avoid the extraction of a tooth. 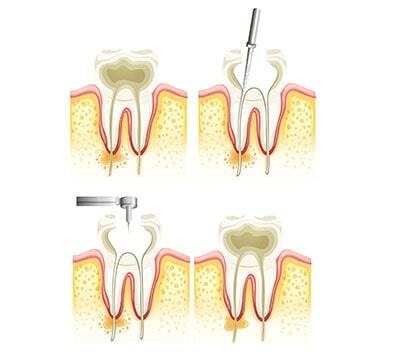 If your tooth is unable to heal itself in the event of disease or injury, a root canal may be your best option. Skyview Ranch Dental Clinic is here to help with root canals designed to alleviate any resulting pain. If you do require a root canal, we offer the following suggestions to prepare yourself before going in. Avoid tobacco and alcohol at least 24 hours before coming in. Consume a filling meal beforehand as eating will be difficult in the hours following due to numbness. Take an over-the-counter anti-inflammatory prior to the procedure, such as Ibuprofen. This can help reduce the eventual swelling. Call the clinic if you are experiencing excessive pain in the days leading up to the procedure. One of our dentists can prescribe an antibiotic to help settle the infection. A good night’s sleep can help reduce any anxiety on the day of.